If you haven’t already got a compost bin now is a great time to make one! With just a few wooden pallets and some wooden stakes you can have a new one built in an hour with these 5 simple steps. 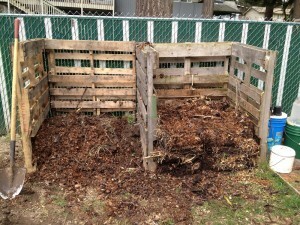 Firstly you will need to clear the area where you want to put your compost bin. Secondly stand one pallet on its side,this will serve as the back of your bin. Drive two wooden stakes down between the slats of wood and into the ground, this will hold the pallet up. Third, place the remaining two pallets at right angles to the one you have already placed and drive more wooden stakes into place to support both of these. You should now have the structure of your bin. Next you will need to wire or nail the pallets together at the corners to secure it together. You can also saw off the tops of the stakes if they are standing out too much. Finally your new compost bin is ready to be filled with garden and kitchen waste. However if you plan on using it a lot you may want to wire on another pallet to the front to act as a gate and even a thin piece of wood on top. ← We’re Still Under Construction!